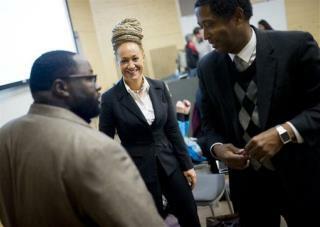 Dolezal changed her racial identity when starting a new chapter of her life in Spokane, according to her adopted brother, Ezra Dolezal. "Don't blow my cover," he quotes her as saying. Ezra, 22, tells Buzzfeed that she claimed he was her son and told people her father was black. Ezra figures she changed her racial identity after encountering racism at Howard University, where she was a white art student in a mostly black school. She got angry and became "hateful to white people," he says. "It’s like what psychologists call self-hating." Ezra also denies Rachel's claim that their parents abused them. "She made herself into a martyr on purpose for people to feel sorry for her and to help her," he says. While teaching a class at Eastern Washington University, Rachel reportedly refused to let a student take part in a class on race and culture: "Rachel said I didn’t look Hispanic," the student tells Buzzfeed. The student is light-skinned but speaks Spanish and identifies as Hispanic. She doesn't know if she's black or white. Women.